The Sheraton Hotel and Towers is located right in the heart of Chicago, close to everything you want to do in the Windy Cindy. In downtown Chicago near shopping, the Sheraton is well-situated as a place to anchor, whether you're in for a quick weekend of sightseeing or an extended vacation. The hotel towers on North Water Street house more than 1,200 rooms, six places for a good meal, and more refreshed space for meetings and/or relaxing—all upgraded for today's travelers. Throughout the hotel, guests enjoy views of the Chicago River, Lake Michigan, and the signature Chicago skyline. All of the 1,214 suites and rooms at the Sheraton Hotel are stylishly dressed with warm earth tones to contrast with the cool colors of the city lights. The windows are large enough to enjoy the views at this hotel along Magnificent Mile, and many of the rooms have seating areas perfect for cozying up and watching the city in motion. The amenities in the rooms include large flat-screen TVs, minibars, coffeemakers, and customizable climate control. The guestrooms are arranged into three different configurations: traditional, deluxe, and club rooms. The smallest of the rooms range between 332 and 338 square feet with skyline views. The deluxe rooms are the same size, and come in the same configuration of king or two double beds, but overlook the lake. The club rooms, with skyline or water views, add on access to the Club Lounge, known for its complimentary breakfasts, 42-inch flat screens and amazing city views. The suites come in four sizes: one or two bedrooms, the hospitality suite, and the elegant presidential suite. The smaller suites come with two bathrooms along with a living room, adjacent to the dining room. The bedrooms follow the suit of the guestrooms with the same stylish decor and a single king or two double beds. Guests can stay connected with the in-room work desk and complimentary Internet access. For those staying in the guestrooms, Internet is available for a small daily fee. The two-bedroom suites also have these same amenities, but in even more space. The master bedroom has a king bed, and the second bedroom has two doubles. Some of the one- or two-bedroom suites have Murphy beds in the living room. Used for meetings and overnight stays at the Sheraton Hotel, the hospitality suite has an expansive seating area with a separate dining room, and two bedrooms. The 1,400-square-foot suit also has a wall made up of windows overlooking the Chicago River, with the vistas heading out to Lake Michigan. In the three presidential suites, windows are prominent features of the architecture. The 2,408 square feet could hold 100 people for a conference or many fewer for overnight stays. The master bedroom has a king bed with an en-suite bath equipped with a whirlpool tub. There's also another bedroom and bath, just steps away from the octagon-shaped living room for optimal views. Whether you're staying in one of the guestrooms or upgraded to one of the suites, you'll have access to the Sheraton Hotel's many amenities. In-room dining is always available, and the restaurants are open throughout the day serving everything from European-style baked goods to gourmet steak dinners. The bar, which opens at 3 p.m. daily, is a favorite gathering place for guests as well as stylish locals. 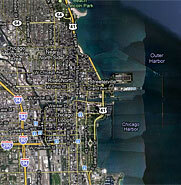 There's also a fitness center and indoor pool, along with jogging trails to Lake Michigan to keep your workouts going. Thanks to the hotel's location in downtown Chicago, the list of things to do near the Sheraton is as long as your imagination.